Confession time: we eat A LOT of pizza at my house. To be completely honest, at least once a week, I send my husband on a pizza run. Call it a pregnancy craving if you must, but I hear no complaints when I announce that we will be having pizza AGAIN for dinner. Pizza is something that we genuinely enjoy eating together as a family. This week, I decided to mix it up a little and make some homemade pizza; after all, there’s nothing like fresh ingredients. Because my family typically gravitates towards the traditional pepperoni pizza, I decided to take a different approach: BBQ Chicken Pizza. This easy (and DELICIOUS) BBQ Chicken Recipe is sure to win over every member of the family! 1. Combine and mix 1 cup flour, Fleishmann’s Pizza Yeast, sugar and salt. Add water and oil. Mix together until all ingredients are well blended. 2. Gradually add an additional 1/2 cup of flour until dough starts to form a ball. 3. Put dough on floured surface and knead dough until smooth. 4. Roll dough into a circle with a rolling pin and place on a round greased pizza pan (a 12-14 inch pan works best). 5. Generously spread BBQ sauce over pizza. Top with mozzarella cheese. 6. Dice cilantro (to taste), red onion, and boiled (or grilled) chicken breasts. Spread toppings evenly on pizza. If desired, drizzle additional BBQ sauce on pizza. 7. Now comes the hardest part – waiting for the pizza to bake with the incredible aroma of BBQ Chicken Pizza filling the air. Bake pizza in the oven for 12-15 minutes (be sure to check after 10 minutes) at 425. Serves 4 people. Fleishmann’s Yeast truly makes this delicious BBQ Chicken Recipe an easy and healthier alternative to carry-out pizza. Loaded with fresh ingredients and baked in less than 30 minutes, our weekly family pizza night has never tasted so good! 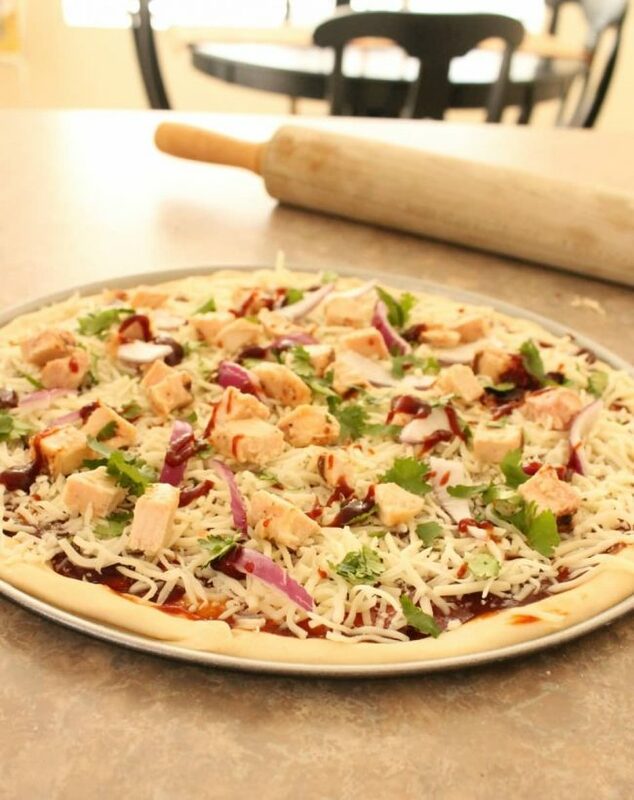 Be sure to visit Fleishmann’s Yeast to take advantage of many delicious and healthy pizza recipes! What a yummy pizza! I definitely like pizzas with different sauces instead of the usual tomato. 🙂 I hope you can stop on by and share this or any other recipe with us on Five Friday Finds! This just became my new favorite thing! Holy Moly do these look good! So glad that I stopped by from the skip the housework link party because these will go perfect with the Lasagna soup that I making tonight! 🙂 I would love for you to stop by my blog to check out my lasagna soup recipe!! I love homemade pizza just as much as bought pizza, both are good in their own way. Your crust looks super easy I might have to try this recipe next time I make one! I found this pizza on Mix it Up Monday. It looks amazing! Pizza is got to be my favorite meal still, this looks delicious, thanks for posting this recipe. Thanks for this. My kids’ll eat just about anything if it’s nailed to a pizza. I’ve never made my own crust for a homemade pizza though. I love making my own pizza. We try to make it a few times a month. This looks and sounds delicious! Thanks for sharing! WOW, that looks so yummy. I’ve only seen this type in pizzerias! I have to admit pixxa is my favorite food and I too could eat this almost nightly. I am not pregnant so cant blame it on that I just love pizza. Oddly thogh, I am not one to have either chicken nor fish on pizza, I know I am oodd, but unless it is really good I can handle either. This doesnt look too bad and being homemade I just might change my mind! Pizza is my absolute favorite food to eat, and make. This BBQ pizza looks delicious. Thanks for the recipe and detailed steps. I am so terrible about making pizza dough from scratch! I always seem to mess it up along the way! I never think to make my own pizza anymore but I need to soon, this looks too good not to be made! So easy too! I love homemade crust, it is the best! Pizza night in our home is always fun, this BBQ pizza looks incredible. I’ve never made my own pizza crust. This pizza looks so good. BBQ chicken as a topping sounds so good! I’ve never made my own pizza crust. This pizza looks so good. BBQ as a topping sounds so good! I have never made my own crust before!! Your pizza looks delicious!! Thank you for the recipe. We are HUGE fans of BBQ chicken pizza in our house. I definitely have to try making these! Now THAT is some game day nom noms, right there. I’m reserving this for The Super Bowl. OH I sure do love BBQ chicken Pizza! What a great recipe! Yum! This is actually the kind of pizza I order for myself. It’s just my favorite combination of flavors. I’ve never tried making my own pizza, but this recipe has inspired me. I can’t wait to give this a try! Yum! I’ll be making this for sure. This looks absolutely delicious! BBQ chicken pizza is my all time favorite. This sounds so good & easy to make, which rocks. oh my gosh this looks so easy and delicious! Oh that looks so good! I have never had a BBQ pizza…or even a pizza with chicken on it! We love BBQ….I will have to try this for my family! My favorite kind of pizza is supreme. 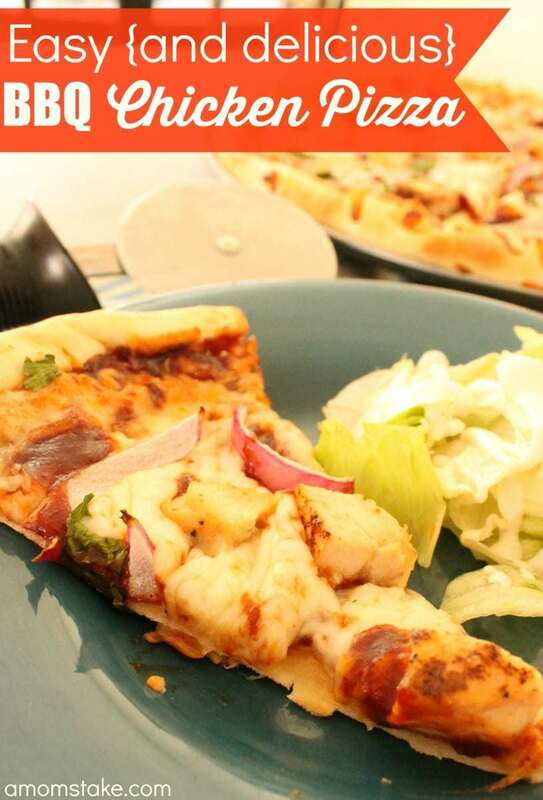 This BBQ Chicken pizza looks SO good & I love the easy recipe. Thanks for sharing! Your pizza looks amazing! I love pizza and we have it at least once a week. I would love to make this pizza! BBQ Chicken is one of my favorite pizzas! Oh yummy! this looks so good, I have never made my own crust before.